Now, I'm quite aware of the fact that there are Super Targets out there that have a full spread of groceries and produce, and there is one in the greater Sacramento area. Only problem is, it's too far off the light rail or bus routes for me to get to it (and I'm not a big fan of Natomas anyway). So when I go to Target, I visit my friendly neighborhood Targhetto - as the locals have lovingly dubbed it - on Broadway & Riverside. It's close enough for me to get to, but far enough for me to get in a pretty good workout on the walk over. Back when I still had a car I used to go there quite frequently for all sorts of things, but I haven't been by that much due to the evil 78-month winter we've been dealing with (I like to round up). So when I headed in to pick up said cat provisions a few weeks ago, I couldn't help but take a quick tour of the rest of the store to see what new stuff was available. This included the food section, and I have to admit I was pretty surprised with what I found. I usually skip the food section of Target because it's usually just filled with sugary cereals, candy and junk food. Until now. I knew they had added a refrigerated/frozen section with cold juices, water, and a couple frozen entrées and pizzas, but I had NO idea it had blossomed into the lovely little food section it is now. True, there is no produce and all the sugary junk is still there, but now there are actually real foods! Milk and cheese and butter, oh my! Not to mention frozen meats & veggies (not just the entrées), great deals on things like olive oil (though it's still cheaper at Trader Joe's, so I held out), and a much wider selection of condiments, pastas and ethnic foods. And stuff I NEVER expected to find at Target, like large, tail-on shrimp, which I actually used for my recent Shrimp, Fava Bean & Asparagus recipe. I figured this section deserved a closer look, and that's what I did today. Now, it's not the most amazing $25 Shopping Cart I've ever done as there was no fresh produce, but I think I did pretty well regardless. A lot of the stuff I bought was name brand, which I don't usually buy unless there's a particular brand I'm devoted to (hello, Wish Bone Italian Dressing! Just $1.39 @ Safeway this week, btw), so I was a bit surprised to see the prices Target was selling them for. If my shrimp had actually been in stock I would have gotten those instead of the chicken breasts, but I couldn't pass up the deal on that chicken, especially considering they were boneless & skinless (that always costs more). The sweetened condensed milk was a bit of a splurge, but I use this a lot for popsicles and other dessert recipes. The butter was the last thing I put in my basket because I already had a stick in my fridge at home and don't use that much, but I reasoned that butter can be frozen and it comes in handy for things like crepes & omelettes. All in all, I was quite satisfied with this particular cart of food, as it would beautifully augment the bare bones staples I had left in my kitchen. Again, this is just an idea of what I could make with the provisions I purchased today, and though this list includes things I've already posted on PGEW, you know I'll probably come up with something new anyway. 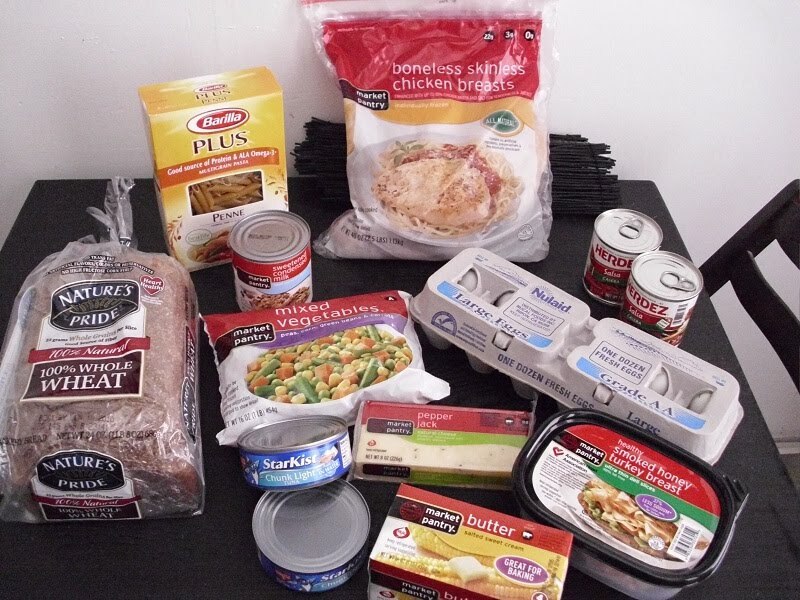 The point is, if you stick to your guns & don't get tempted by pre-made entrées and processed foods, and if you keep a running inventory of what you already have in stock in your pantry & kitchen, you really can make a small amount of money go a long way. You don't have to spend your money on greasy, bad-for-you fast food, when you can do much better at home! Stay tuned for the next edition of The $25 Shopping Cart in the next few weeks. And don't forget, some fabulous new recipes are coming this weekend! The sun is allegedly set to make an appearance this long Memorial Day weekend and for *gasp* ALL of next week. I've become quite the Doubting Thomasina about this whole sunnywarmweather thing as we have certainly been robbed of our usually lovely spring this year. But when I poked my head out from under the covers this morning to find the blinding morning sun shining through my bedroom window (I really need to get that other set of curtains up before I get my own version of Lasik courtesy of the sun), I realized the good meteorologists of this city were actually right. In celebration of this most glorious event, I decided to break out some pineapple and make something sunny looking. My dream dish was actually some Thai style curried pineapple fried rice; you know, the kind they serve in a giant pineapple with all sorts of yummy goodness garnishing the entrée. Alas, I did not have a whole pineapple, and I didn't really feel like having fried rice again, as I'd just made some shrimp fried rice earlier this week. 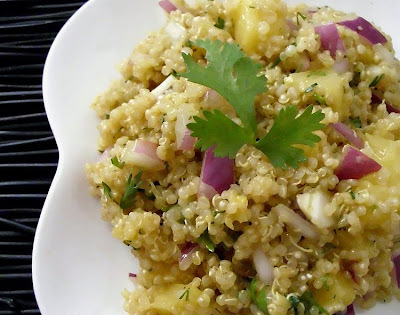 I remembered I had plenty of trusty quinoa in my cupboard and thought it would be fun to make a light salad with some sweet pineapple thrown in. That idea gave way to thoughts of curry which turned into a random curry vinaigrette dressing concoction, and a little while later, I had a lovely little quinoa salad to add to my ever-growing quinoa repertoire. What I love about this dish - aside from the flavor and aesthetics, of course - is that it's a true Bare Bones special. Now that I'm all caught up on rent, I'm trying to catch up on other bills before my current work assignment ends, so I'm working with the absolute last things I have in my kitchen until I can do another $25 Shopping Cart (which I'm hoping to do this weekend). Aside from the dressing, this salad only requires 4 ingredients, and they're all things that I try to keep on-hand as often as possible. Having a well-stocked spice pantry allowed me to create a dressing that required very little effort but packed quite a flavor punch to tie these simple salad ingredients together. Just goes to show that a little creativity can go a long way, even when you're only faced with 4 ingredients in your kitchen. Combine the dressing ingredients together in a small bowl and whisk together vigorously until completely combined. Set aside. In a large bowl, combine the salad ingredients and toss together. Add about half of the dressing and fold together until well mixed. Check for flavor and add the rest of the dressing if needed (I found that the quinoa quickly absorbs the first part of the dressing, so you may want to use the entire amount). Serve on its own, as a picnic side or with fresh greens, garnish with extra cilantro, and enjoy! FREE! Bonus Lesson from "How to Cook Real Food" & Site Updates! I can't recall ever being this update-y on PGEW, but I guess that's what a redesign will do! Well, that and an increase in frustrated crying and attempts to hurl my computer out the window, but I'm sure my fellow bloggers who've done this on their own feel my pain. ANYWAY, because A) the uploading process of my pretty new design isn't going as well as I'd hoped, B) I have a couple of nom-worthy recipes and a new product review to share, and, most importantly, C) I want to save my sanity, I am going to wait until the long weekend to continue fighting with this thing. Hopefully some time away will help me figure out what's going wrong. Plus, this gives me a chance to relax and get to all the other good stuff I want to share with you! Like this super awesome bonus that Jenny at Nourished Kitchen is sharing with everyone! You've all seen my posts about her upcoming eCourse, "How to Cook Real Food", but I know some of you are a bit hesitant to sign up because of the cost (though, it basically comes out to just $10/class. You can't find a deal like that for most cooking classes held at schools or community centers! But I digress...). Or perhaps you've held out because you're still not too sure of what will be covered in each class. Well, here's a great opportunity for you to actually check out a special bonus class for FREE! Jenny has asked me to share this wonderful bonus lesson on Nuts & Seeds with all of you, and after checking it out for myself last night, I can assure you that you will learn a LOT. Not only does she give you video lessons on the health benefits of nuts & seeds, she also shows you step-by-step how to make two great nut-based recipes. As if that wasn't good enough, she also provides downloadable worksheets & recipes that contain a ton of great information. And you get it all for free, here on PGEW (You don't even have to leave this page! Just scroll down a bit.). What's not to love? Enjoy your free lesson! I learned a lot and hope you'll like it as much as I did, and stay tuned for some great new recipes! Lately my friendly neighborhood Safeway has been surprising me with some of their sales. Of course, I can still beat most of their prices by going to different stores, but some of their weekly specials have been pretty amazing: blackberries at 10 boxes for $10; avocados for a buck a-piece or less; medium raw shrimp for just $4.99/lb; in short, they're really stepping up their game when it comes to their Club Card specials, and it's working, because it makes me go there more often than I normally would. Over the nice weekend, I stopped by for cat provisions, inexpensive blackberries, and something I haven't had in a long time: fresh red bell peppers, just $0.99/lb. Now, I normally like to get most of my produce from the farmer's market, but with the freaky weather (65 degrees & rainy at the end of MAY??? C'mon, Mother Nature!) two things have happened: stuff that should be growing in abundance right now is not, and I just refuse to go traipsing about in blustery weather if I don't have to (I'm fairly certain I was a cat in a former life; hate being wet). My freezer's been stocked with plenty of good frozen veggies & fruits so I've made due that way, but I have really missed getting the good, fresh stuff. True, the cheap bell peppers came from Mexico, but it was sure nice to enjoy the crisp sweetness of a fresh one once more. And the two that I got were so lovely, that I knew I couldn't just hack them up into little pieces. Their aesthetics also had to be enjoyed, and the best way I felt I could do that was to use them as natural dishware and stuff 'em with something delicious. 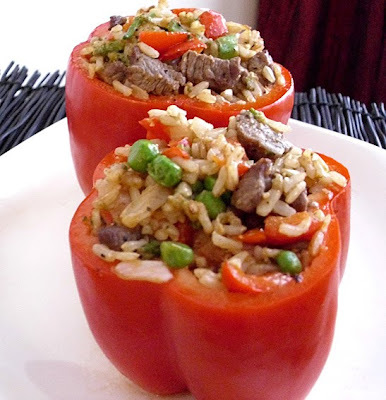 Stuffed pepper recipes are all over the place and usually consist of a lot of ground beef, bread crumbs and cheese. Not a bad combo taste-wise, but I do prefer to have color in my food and didn't want something that heavy & rich. Instead, I used some brown rice, lean steak, and some nice red & green veggies for a nice contrast. The end result was a beautiful, completely satisfying meal with hardly any clean-up because I got to eat the "bowl"! :) Seriously though, this is a wonderful dish to prepare for a nice twist on dinner, and though I made mine from scratch, this is a fabulous way to make use of leftover rice and meat, not to mention all those tiny bags of leftover veggies that may be lurking in your fridge or freezer. Paired with a nice salad and a glass of wine, this can also be a different, slightly elegant way to end a hard workday without having to break the bank. Preheat oven to 350°. Prepare a small, shallow baking dish with a very light coating of cooking spray and set aside. Rinse the bell peppers and pat dry gently with a paper towel. Slice off just the very top of the pepper and remove the seeds & veins. Take the "lid" of the pepper and cut off the remaining flesh, dicing into small pieces. Set aside with the rest of the veggies. In a large skillet, heat the olive oil and add the minced garlic and onion. Sauté over medium heat until fragrant, then add the diced steak and all the seasonings. Cook for about 2 minutes or until the steak begins to brown (don't overcook as this will continue cooking in the oven!). Add the diced peppers, tomatoes, peas, broccoli and rice, and stir together until completely combined. Check for seasonings and adjust accordingly with salt & pepper. Cook for another 3-4 minutes. Remove from heat and set aside. Spoon a generous amount of the rice, steak & veggie mixture into each pepper until completely full (go ahead, pack it in!). Place the stuffed peppers in the prepped baking dish, tent with foil, and place in the oven. Cook for about 30 minutes and remove from the oven. Allow to cool for about 5 minutes. 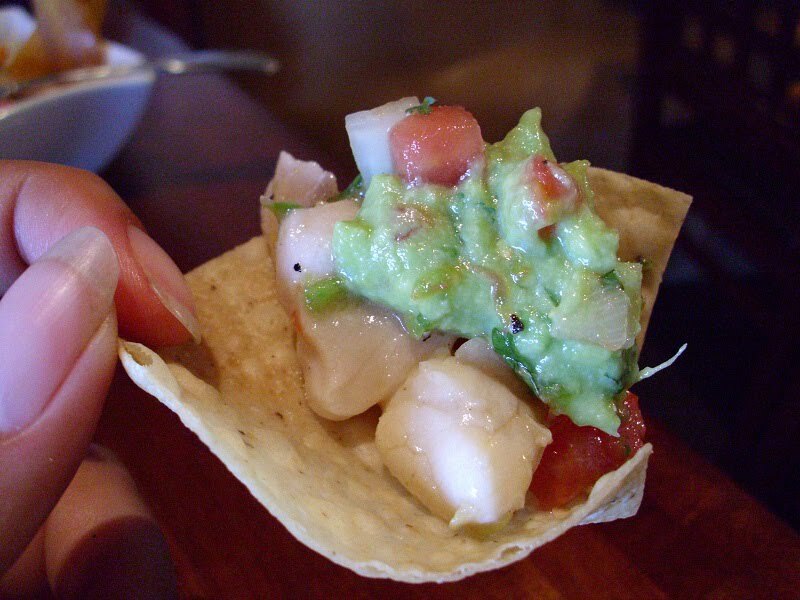 Serve with a nice salad, and enjoy! Just a quick note to let you know that things are going to look pretty funky on here for the next day or so! It looks like there will be a way to get the new design going, but I am far too Blogger illiterate to do all this without having all my changes show in real time. So PLEASE bear with me (especially all you new readers... things don't normally look this bad, I swear)!!! "How to Cook Real Food" eCourse from Nourished Kitchen! So I was hoping you'd all wake up today to find the lovely new look of PGEW, but as I mentioned on Facebook & Twitter last night, I'm having major difficulties getting this all uploaded onto the site. *sigh* I worked quite hard on this, so I hope it doesn't take too much longer to get it up & running for you (and me). Anyway, I've consulted my people and hope to have a solution this week! In the meantime, I'll be working on a new recipe (that I am soooooo ready to eat! It's gonna be a good one!) so I'll have that up tonight or tomorrow. And I wanted to remind you that there is just 1 week left to sign up for the "How to Cook Real Food" eCourse from Nourished Kitchen! Not only is this a fantastic way to learn to make amazing basics like stocks, breads, and even soda pop in your very own kitchen, you'll also be helping Poor Girl earn a small portion of the proceeds if you sign up through PGEW. This is a wonderful opportunity that Jenny of Nourished Kitchen has extended to folks who want to eat healthier, better foods, and to bloggers who are just as passionate about eating real food as she is. Stay tuned for the new recipe and, hopefully, the new look of PGEW! Although real spring weather has yet to really hit California this year, we have been lucky enough to get a few lovely, 70+ degree days in the midst of all the rain & gloom. 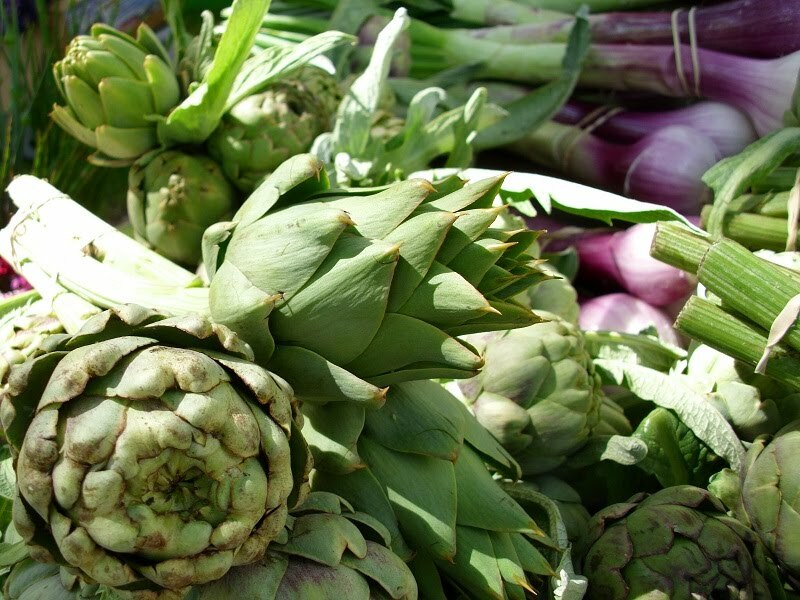 In these beautiful days beautiful produce has burst forth, and there have been all sorts of incredible fruits & vegetables popping up at farmer's markets & grocery stores alike. 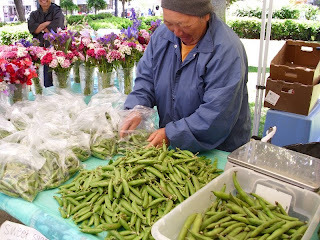 Right now the popular ones are cherries, strawberries, fava beans and the last bits of tender asparagus. As I'm very familiar with cooking all but the favas, I figured it was high time I started playing around with them in my own kitchen instead of just enjoying what was made at some of my favorite restaurants. I truly love fava beans (and not because they make a sorta cameo appearance in The Silence of the Lambs, one of my 2 favorite movies of all time), but as I mentioned before, I've never really worked with them. My recent Follow the Chef Tour with Chef Michael Tuohy of Grange Restaurant gave me a boost of confidence to start working with them, particularly because he taught us that the easiest way to get around that arduous shelling process was to simply blanch the beans before working with them. As I expected, it worked like a charm and I had no trouble at all working with these legumes. Because they're so light, green and flavorful, I thought they'd play off the last batches of tender asparagus that our area had to offer. And a beautiful complement to the whole dish turned out to be some perfectly pink shrimp; no muss, no fuss, just beautiful crustaceans cooked to simple perfection. I had also recently scored some lovely blood orange infused extra virgin olive oil from Florio's Fine Foods in Grass Valley, so I decided to make a simple dressing using this lovely oil and Meyer lemons. A couple scrapes of Meyer lemon zest and I was on my way to a delightful late spring dish that is certain to please for several months on end. No Meyer lemons? No worries! Regular lemons also work, though they may lack a bit of that sweet fragrance that most of us love about Meyer lemons. If all else fails, use a bit of freshly squeezed OJ to balance out the sweet aroma, and you'll have a lovely dish. Prepare the dressing by combining the lemon juice, olive oil, garlic, sea salt and pepper in a small bowl and whisking together until completely combined. Bring 8 cups of salted water to a boil and add the fava beans. Blanch for about 90 seconds and immediately place them in 6 cups of ice water. When beans have cooled, shell and place the beans into a small bowl. Repeat the blanching process with the asparagus; plunge into ice water when cooked, drain and slice into 1" pieces. 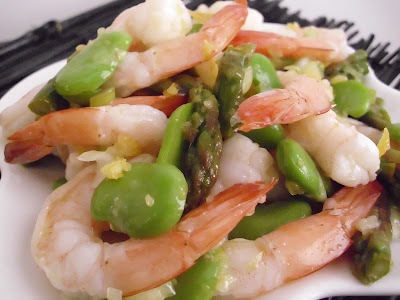 Combine the thawed shrimp, shelled fava beans and sliced asparagus in a medium bowl. Add the dressing and toss together until all veggies & shrimp are completely coated. Marinate in the fridge for about 30 minutes; serve on small plates, garnish with extra lemon zest, and enjoy! After what has seemed like an eternity I am finally, finally caught up on my rent (most of you will remember this winter’s bouts with pneumonia, the flu and bronchitis made me fall behind & have a hard time catching up). *cue applause* I’m still flat broke but honestly, I couldn’t be happier because now I can breathe a bit easier knowing that I can pay my landlord on time, without having to incur the evil monthly late fee that certainly didn’t help at all. Since I’m not in the position to go out to celebrate, I figured I’d celebrate at Chez Poor Girl with a new dessert. And for once, I didn’t feel like celebrating with crepes. (!!!) That’s because lately, I’ve been obsessed with bringing some of my new dessert shot ideas to fruition. A few weeks ago I was struck with a brilliant idea for one that will be perfect for summertime (will probably post it next month), but I thought I should finally give that one failed experiment another go and see if I could make it work. Not that the end result of the experiment-gone-awry didn’t turn out well; a lot of you really seemed to like it! But I’ve wanted to see & taste this next recipe for a few months now, so I gave it my best shot. I’m happy to report that it finally came out the way I wanted it to. Now, I’m a huge fan of coffee and coffee-flavored drinks & desserts; however, my problem with the latter is that they are usually far too sweet for me to taste the coffee. Maybe I was just spoiled by all those trips to Colombia when I was a wee lass, where I could taste some of the world’s most incredible coffee. Some of my favorite memories from childhood are coffee-related: picking ripe coffee berries off the trees and enjoying the way the sweetness of the berry and the bitterness of the bean would play off each other; watching coffee in its early stages of picking & processing at my family’s plantations; rolling around in dried coffee beans that were baking in the sun (don’t worry; most coffee has not been rolled around in by 9 year olds). It’s a huge part of my heritage and I am very particular about my coffee and coffee-flavored things. So I figured it would be fun to try my hand at my own coffee-flavored dessert but I didn’t feel like going the mocha route, as that’s been done quite a bit. Instead, I decided to work with the next most popular coffee & sweet combo and create some Caramel Macchiato Cheesecake Shots. In my mind’s eye and in my palate’s imagination (yes, my palate has an imagination) I envisioned tiny little versions of this popular coffeehouse drink that would definitely taste like coffee and look the part, too. I find these to be absolutely adorable to look at, as they come complete with their own “steamed milk” topping and caramel drizzle. But they also taste delicious and quite similar to the actual drink. 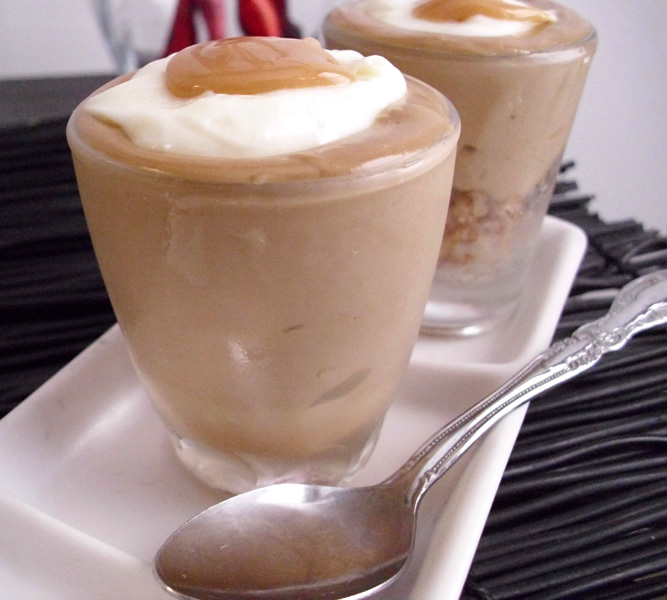 The coffee “cheesecake” is sweet enough to be delightful but definitely packs a coffee punch, and the sweetness of the “steamed milk” topping and the homemade caramel add a wonderfully sinful touch. Now, I will warn you: these are RICH!!! This is one dessert that could never be bigger than shot size because you would immediately end up 10lbs heavier with a few cavities to boot. But, as I have always argued when it comes to my tiny desserts, this is really all you need to end a fabulous meal: just a li’l somethin’ sweet. They’re a little more complicated to make than most of my other shots, but they’re well worth it. Hope you like them! NOTE: Do NOT use regular brewed coffee or espresso! The flavor will be great but you’ll end up with a runny mess that will never set. Also, if you want the true “cheesecake” experience, try them w/the vanilla wafer crust. But if you’re going for the whole “coffeehouse” experience, just use the caramel and cheesecake fillings. Either way, these are great! Combine the instant coffee granules and the hot water in a small bowl until the granules completely dissolve. The coffee should have a thick, syrupy consistency. Using an electric mixer, whip one package of softened cream cheese until it is light & fluffy. Add the remaining half of the condensed milk and the coffee syrup and mix together on medium speed until thoroughly combined. Set aside. In a medium bowl add 2 tablespoons of sugar to the remaining 1/2 package of softened cream cheese. Mix together on medium high speed until light & fluffy. Melt the butter in a small saucepan. Add to the crushed wafers and mix together until the wafers are moistened. 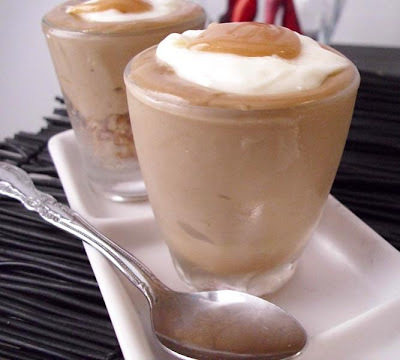 Assemble your shots by adding about a teaspoon of caramel (or cookie crust) to the bottom of each shot. Next, add about 2 tablespoons of the coffee cheesecake filling (or enough to fill your shot glass), followed by a small dollop of the “steamed milk” cheesecake. Top with a small amount of caramel, refrigerate for about an hour or so, and enjoy! ~ First and foremost: PGEW is finally getting a makeover. That's right: after almost 2 years of my oh-so-lovely deep blue (I do prefer cool colors...) and simple layout, Poorgirleatswell.com will finally have a complete redesign in the next few days, so stay tuned for that! I'm very excited to do this (though I'll miss my deep blue), and hope you will all enjoy the new site design and features. It took a lot of site-related soul-searching and some convincing from some more experienced foodies to finally come to this decision, but I have to agree that the time has come for my baby blog to grow up a bit. You've all seen the recipes get more refined, and the tips become more useful; it's high time that the site should reflect the same image that my food is presenting. Don't fret, though! It will still hearken memories of the original PGEW layout, so you'll still feel at home. I hope you'll all like the changes made and that they'll facilitate an easier, more enjoyable experience on PGEW. Expect everything to be ready on or before May 23, 2010. ~ The fine folks at Foodierama have asked me to be a part of their awesome site! Those of you who are food blog addicts will definitely enjoy Foodierama as you'll be able to get the latest & greatest posts from the food websphere on one easy-to-access page, instead of poring through page after page of blog titles. It's a wonderful site that allows you to view all of the best food blogs on one page, so be sure to add it to your bookmarked pages! You'll be glad you did. ~ If you've ever been interested in learning how to make your own stocks, broths, etc., so that you can cook real food (including PGEW food! ), you should definitely sign up for this online course from Jenny @ Nourished Kitchen! Beginning June 1st, she will be offering a unique online class called "How to Cook Real Food". Jenny will guide you through the methods she uses to create all the basics you need in your kitchen so that you can eat nutritiously AND affordably (and you all know I preach this on PGEW constantly!). From how to make your own sourdough bread to how to make your very own homemade soda pop, this 12-week course is sure to help take away some of the mysteries behind all the "extras" we buy at the store, not to mention the fact that it will be far better for you without all the extra additives & preservatives a lot of store-bought products contain. Awesome, right? Honestly, if I could afford this, I'd be taking this course myself! But the good news is that you'll be helping me out, too! By signing up for this course through the links offered here on PGEW, you'll help me earn a small portion of the proceeds, which, in turn, will help ME help bring you more of the great recipes you all know & love. You'll have to hurry, though! The deadline to sign up for the course is May 31st. Click here for complete details & enrollment information. ~ On a related note, I figured I'd share a sneak preview of one of the cool new features I've been working on for the new PGEW. I've received some feedback regarding things like omelettes & crepes and how it's a little difficult to navigate the site to find the recipes I've linked to which contain the basic recipes. I've gone ahead and created a "Basics" section, in which you'll find basic recipes & techniques for making things like omelettes, crepes, etc., as well as some cooking & ingredient definitions that will help take the mystery out of some of the things I post about. You'll probably see that before the launch of the new look, so stay tuned! I think you'll all really like it. Anyway, that's it for now! New recipe(s) coming in the next few days too, so be on the look out for those! One of the things I've learned along this journey I like to call Poor Girl Eats Well is that a lot of fancy sounding food isn't as complicated as one would think. 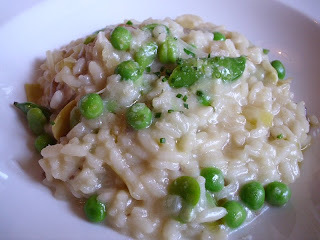 I remember the days last year when I was petrified about trying my hand at risotto-making, only to realize it was a cinch to make and that I probably just wasn’t too keen on the idea of standing & stirring for 30 minutes in a row (I prefer perching daintily on a lily pad while I cook). I’ve experimented with ingredients I’d enjoyed eating but never cooked with before, and have realized that I am swiftly becoming the queen of making sauces out of anything, when I once believed I only rocked at homemade spaghetti sauce. So I’ve basically started to unravel the mysteries behind certain dishes, cooking techniques and types of cuisine in my own kitchen, and I must say it’s just as much fun as enjoying it all in restaurants. This next dish isn’t all that mysterious, per se, but I think it’s the idea of having something traditionally “French” that makes me all giddy to make it. Ever since my parents took me to my first French restaurant at the tender age of 8 and I experienced such rich, incredible food, I have been absolutely in LOVE with French cuisine. However, I’m still a little too kitchen-shy to pull a Julie Powell and tackle anything too complex just yet. But when I was planning my Mother’s Day brunch, I wanted something a bit different from my usual brunch menus which normally consist of omelettes or crepes, and the way everything was falling into place with the salad and the parfaits being slightly French-ish, I figured a Croque Madame would be the perfect entrée. It’s essentially a fancy grilled ham & cheese sandwich. Well, the Croque Monsieur, is. 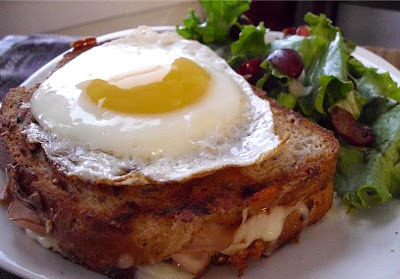 There are many variations of the Croque Monsieur, and the Croque Madame makes itself special by topping the finish product with a perfectly fried egg (and we all know how good fried eggs are on sandwiches!). Croques Madame & Monsieur vary from café to café in France (or so I’ve read), so you really have a lot of room to play around with this. Some recipes call for mayonnaise, others call for lots of butter; personally, I like to use a homemade honey & Dijon mustard blend on mine, as I feel this accents the rest of the flavors beautifully. Traditionally this calls for Gruyere cheese and that’s how I made it for me mum, but I have slummed it in the past and used lesser cheeses (I think I’ve even used string cheese before! When you have a craving, no other ingredients work to make a decent meal, and you’re too broke to go to the store, you learn to improvise!). And when I’m really in dire straits and all I have are those little $0.79 packets of thinly sliced deli meats to work with, I find that they make a lovely substitute for the nicer smoked ham that may cost just a bit too much during scary week. Poor Girl Tip: If you want to make this with Gruyere, buy yourself a small chunk that you can reasonably afford and grate it instead of slicing. You will yield about twice as much cheese without having to spend more! Whisk together the Dijon and the honey until smooth and set aside. Spread a small amount of butter on each slice of bread and place face down on a heated skillet (use medium heat for this). Grill for about 30 seconds or until the buttered side has just begun to brown and become slightly crisp. Remove from heat and brush the honey & Dijon mixture on the grilled side of each slice of bread. Add about 2 oz. of grated Gruyere on each slice. Melt about 1 tablespoon of butter in the same skillet and place the cheese covered bread slices in it to grill (cheese side up, of course) and top each slice with equal amounts of sliced ham. Put both sandwiches together and grill over medium heat for about 3-4 minutes on each side, until the cheese has melted and the bread is golden brown & crisp. Remove from heat & cover to keep warm. Well, Mother's Day weekend is over and I have to admit I'm left with a bit of a hollow, empty space in my heart now that me mum has headed back to the Bay Area. For the first time (ever, perhaps? ), I had her come up this way for the holiday, mainly because I wanted her to have at least a brief "vacation" from everyday life and the difficult, tragic week we've gone through with the rest of our family. We took some nice walks, planted the first couple plants of my very first garden (hooray!!! ), and, of course, enjoyed some fantastic food together. And I'm proud to report that my super secret Mother’s Day brunch was a complete success! I don’t think I’ve ever heard my mom react to any of my cooking the way she did this weekend and she even had seconds, which she normally doesn’t do. Mom was absolutely overwhelmed by the spread (in fact, she started digging in before I could bring her her present! ), and declared it my most delicious meal to date. She was even more impressed when I told her the entire meal, including the mimosas, cost just over $30! Not bad for a gourmet brunch for two, even with splurges like Gruyere cheese and sparkling wine. So how did I manage to pull this off for such a low price? I think it was a combination of planning and careful shopping. Because I knew I wouldn’t be able to go overboard on buying too much extra food, I got serious and took detailed inventory of what I already had in my fridge, freezer and cupboards. Once I’d come up with a rough menu outline based on what I had on hand and the potential dishes I could create, I went shopping only for the ingredients I absolutely needed and paid very close attention to the prices at the store. To ensure the lowest prices, I went to both Trader Joe’s and Safeway: cheese is way more affordable at TJ’s, so I was able to score a nice chunk of gruyere for just $3.25 (that took some major digging through larger, more expensive blocks, but I knew persistence would pay off! ), while Safeway was offering better deals on champagne & sparkling wines because of the Mother’s Day holiday (YAY for $4 champagne!). I was extremely lucky to have just scored some lovely cherries at last week’s farmer’s market and figured I’d showcase the extremely easy recipes for the two cherry-inspired dishes I ended up serving. 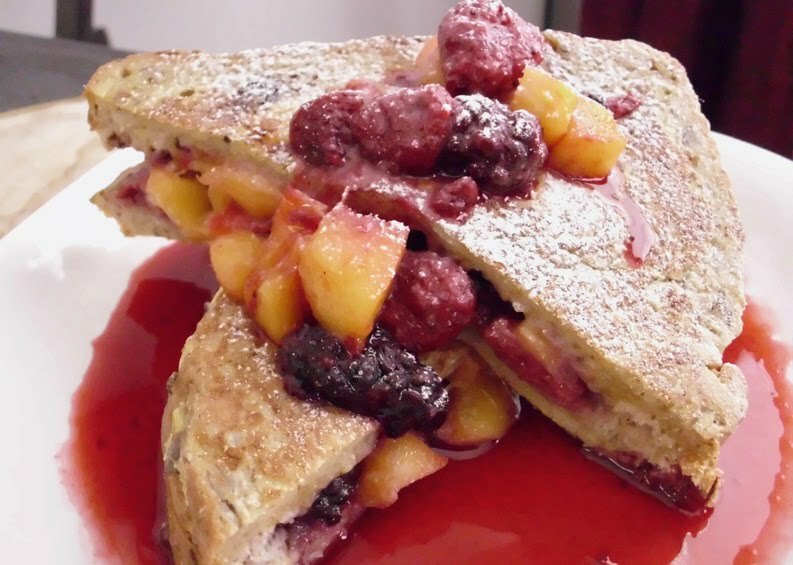 I’d considered making the Mango-Berry Stuffed French Toast with cherries instead of mixed berries, but decided not to go in that direction because I wanted to have more savory dishes than sweet ones. Because I was serving Croque Madame (a common French sandwich that is basically grilled cheese & ham with a fried egg on top), I thought a nice salad would complement this beautifully. I knew I wouldn’t be using all the cheese in the Croque Madames, so I did some mental food math and decided to combine the cherries, the cheese, and the remainder of my giant head of butter lettuce to make a delicate spring salad that I must say I’m going to be making a lot from now on. The sweet tartness of the cherries, the earthy nuttiness of the cheese, and the satiny leaves of butter lettuce all went together wonderfully, especially with the addition of a tasty white wine vinaigrette. Let’s check out the recipe. Prepare the dressing by whisking together all ingredients until completely combined. Set aside in the refrigerator. Next, rinse and dry the butter lettuce and tear into 1”-2” pieces. Combine the lettuce, scallions and cherries in a medium bowl and toss together. When ready to serve salad, drizzle about 1 to 2 tablespoons of the dressing and toss until everything is completely coated. Add freshly ground pepper and a couple extra shavings of the gruyere if desired, and enjoy! In a medium bowl toss together the cherries and sugar until they release their juices and create a light syrup. In a separate bowl, whisk together the honey and Greek yogurt until smooth. Alternate layers of cherries and yogurt in each shot glass, drizzle small amounts of remaining cherry syrup on top, and enjoy! That’s it for now! And don't forget to stay tuned for the Poor Girl version of Croque Madame in the next couple of posts. Cheers! I think the belated birthday brunch I made for my mom a couple weekends ago spoiled me a little, because I found myself craving something sweet and elaborate once again. I actually made this recipe last weekend as a possible Mother’s Day brunch experiment for me mum (we’ll see if I use it; I have a ZILLION other ideers in my head for this weekend’s brunch). As I was out of the fixings for the fresh strawberry crepes I made for her birthday crepes, I had to regroup and come up with something else that would be just as satisfying, but different from my standard crepe indulgences. With 3 gorgeous, ripe mangos staring at me from my Big Bowl and some frozen berries I’d been meaning to finish, I knew another sensational fruity dish was a-comin’. And since I hadn’t had French toast in simply AGES (since my birthday, I think), I knew said dish would just have to be of the French toast persuasion. This was my first attempt at a stuffed French toast version of my own and it turned out quite well. The mango & mixed berry combo was tasty & vibrant, and because I kept the other ingredients simple, it wasn’t the rich, heavy breakfast that it could have been. Not that I mind a rich breakfast every once in awhile, but let’s face it: a nice thick brioche, oodles of heavy whipping cream, and all the other amazing ingredients that can go into a restaurant-style stuffed French toast are not exactly Poor Girl friendly when it comes to my nano-budget. Especially when I had a nice loaf of oat & nut bread I could work with (like I always say: use what you have on hand!). The end result was a perfectly delicious, but much healthier version of this fun breakfast dish with plenty of sweet fruit. And as I just mentioned, keeping things simple & light reduced the cost dramatically. This is wonderful on its own but would also make a great addition to a Mother’s Day brunch buffet by keeping the pieces small and serving alongside other great dishes. In a small bowl combine the mixed berries & granulated sugar and allow to sit for about 1/2 hour, or until the berries have created their own syrup. Add the mango and toss together gently. Set aside. Whisk together the eggs, milk and vanilla extract in a large bowl. Lightly butter each slice of bread with the teaspoon of butter (this will prevent the bread from becoming soggy from the berries), and add about 1/8 cup of the berry mango mixture to each slice. Put the slices together to form sandwiches, then dip each sandwich into the egg mixture. Melt the butter in a medium skillet and place one of the sandwiches into the skillet. Cook over medium heat for about 4-5 minutes on each side, until golden brown and slightly crispy along the edges. Repeat with remaining sandwiches. To serve as pictured, spoon a bit of the berry syrup onto a small plate and swirl around until the bottom of the plate is coated. Cut each French toast sandwich diagonally in half and stack together. Top with the remaining mango-berry mixture, dust lightly with powdered sugar, and enjoy! So there’s this can of garbanzo beans in my cupboard that’s been flirting with me for a few weeks now. At first I thought it might be fun to make some of that fabulous little Curried Garbanzo dish I made last year for the Hunger Challenge but I realized I had no curry ingredients handy, so I scratched that and ignored the beans. Every few days it would catch my attention again, but I would get distracted by other things in my kitchen and worked with those instead. Lacking the energy or inspiration to do much of anything during such a sad week, I finally put this can to good use and turned it into a nice, easy salad that would bail me out of a couple of lunches or light dinner. Another bean salad, Poor Girl? Yes, ma’am! (And/or sir. Sorry gentlemen, I didn’t mean to exclude you; you know I love ya.) Before you start moaning & groaning, hear me out for a bit. 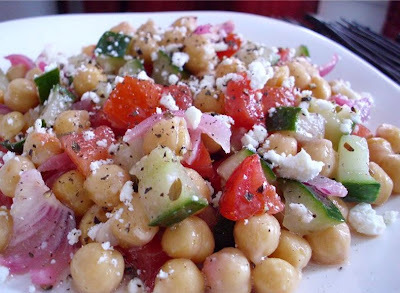 Aside from the simple-to-prepare and time-saving factors, a good bean salad is an easy way to have a pretty balanced one-dish meal. Packed with protein and fiber, legumes are great nutritional multitaskers. Add some chopped vegetables and a tasty dressing and you have either a fabulous lunch or a great side to complement those summer dishes that will soon be appearing on everyone’s tables. Like rice salads, they help you use up any leftover veggies so you don’t end up having to waste anything you don’t have to. But my current favorite thing about bean salads – or just beans in general – is how international you can get with them just by changing up the other ingredients. From Indian to Mexican to everything in between, there are endless ways to spice up some legumes. This time around I thought I’d go the Mediterranean route, especially because I had just scored that giant cucumber and gorgeous tomatoes at La Superior during my last shopping trip. With some sliced red onions and a simple lemon & olive oil dressing, this turned out to be light & refreshing but definitely satisfying. Of course, you can’t do “Mediterranean” anything without some crumbled feta cheese, so some of that was thrown in as well. When all was said & done, I had enough food for a couple great meals and the whole recipe cost just around $3 to make. This recipe is easily doubled and would be perfect for summer potlucks & picnics, too. Let’s check it out! Place all the veggies into a large bowl and toss together. 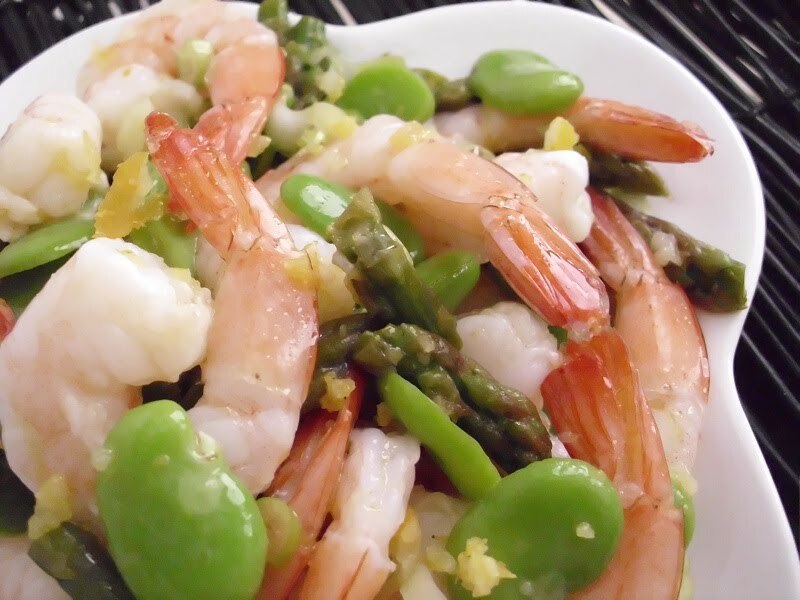 Briskly whisk together the dressing ingredients, add to the beans & veggies, and toss together until completely coated. For maximum flavor, I strongly suggest letting this marinate a couple of hours if you have the time. When ready to serve, add the crumbled feta & toss together (or you can just crumble it on top as a garnish if you prefer). Serve by itself or as a side, top with freshly ground black pepper, and enjoy! Although Sacramento has a couple of year-round farmer's markets, yesterday officially kicked off our farmer's market season, welcoming back the markets at Fremont Park, Roosevelt Park, Downtown Plaza and Cesar Chavez Plaza. From May to September, regional & local produce & flowers are available almost daily in this area, and chefs and amateur foodies (or "eating enthusiasts" as Greg of SacEats prefers to dub us) go wild with the possibilities. Today I experienced a full-on farmer's market extravaganza, from my own tips on how to make the most of your market experience to an exquisite meal prepared by one of Sacramento's best chefs with some of the area's freshest produce. I started my day at the Cesar Chavez farmer's market with Wendy from our awesome ABC station, News10. 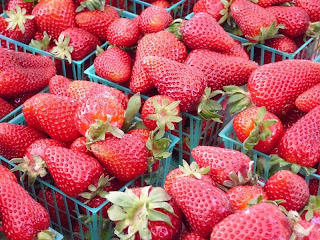 Spotlighting the opening of farmer's market season, we discussed the benefits of shopping at one's local farmer's markets and dispelled a few myths that surround them. What kinds of myths, Poor Girl? Prices, for one. 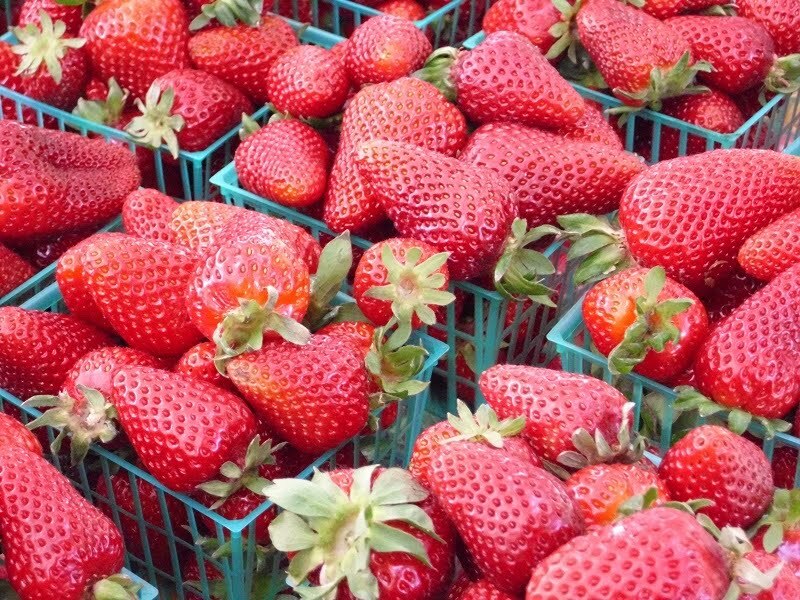 It's a common misconception that if you go to a farmer's market you'll be paying way more for your food than you would at your trusty major chain grocery store. Though this can certainly be the case when it comes to meats & cheeses and a few specialty items like preserved/dried produce, in general you can actually save quite a bit of money for higher quality food. By buying local, sustainably grown produce, you're eliminating the middle men and lowering the cost of your food. No extra transportation costs by trucking in foods from distant areas; no extra coatings of wax or other preservatives to make produce look "perfect"; no fluoridated water drenching your produce so that if it's not dried instantly it spoils faster; little to no pesticide use... I could go on for days. And then there is the added benefit of knowing that you're supporting your local farmers, who, like most of us these days, are struggling to stay afloat in this shaky economy. Keeping your shopping local supports local businesses and, consequently, your local economy. In addition to these benefits, shopping from your local farmers really does result in more delicious fruits & veggies. Why? Because farmers are going to grow & sell what Mother Nature deems appropriate. Unless it's purely for crazy profit, you're probably not going to see a local farmer selling you hot house tomatoes in early December, even if he is based in California. Nor will your farmer sell you oranges in July. Like the weather, food has its seasons, and when fruits and vegetables are in season, they will be more plentiful and thereby more affordable. Not to mention more delicious because they're at their peak! And when things taste better, they're easier to turn into tasty dishes that even the most finicky of eaters (read: KIDS!) can enjoy. 1) If you like a better selection, be one of the first customers at your market. Head there slightly before the market opens if you can and you'll find the prettiest produce. 2) If you prefer cheaper prices, go towards the end of the market's schedule. By this time a lot of the most aesthetically pleasing produce will be gone and vendors are looking to get rid of the remaining food, so prices can go down quite dramatically. 3) Do a complete round of the market before you commit to buying ANYTHING. Now, if you're a fresh produce freak like me, this is easier said than done. But it can really pay off if you exercise some restraint. Remember, there will be several vendors selling the same types of produce, so it's quite possible to find a bunch of cilantro for $0.99 at one stand, with another stand offering the same thing at $1 for 3 bunches. Depending on which market you visit, the stands near the entrances & exits may have higher prices because they're the first or last folks you'll visit, whereas the stands in the middle of the market may offer lower prices (sort of similar to how grocery stores are laid out product & price-wise). If you do a quick tour of what's available and make a mental note of where the cheaper prices are offered, you can save yourself several dollars at the end of your visit. After talking with Wendy a bit more and sharing our common backgrounds in food & cooking, we went our separate ways and I hung around the park until it was time to join the fun of the Follow the Chef Tour with Chef Michael Tuohy of Grange. Many of you may remember Chef Michael from my posts on last year's Foodbuzz Blogger Festival and my review of the Duck-Off challenge between Chef and Hank Shaw of Hunter, Angler, Gardener, Cook. Because Grange specializes in local, seasonal menus made with the best of our state's produce, meats and seafood, and because Chef happens to have an incredible internal seasonal-eating clock, he's the perfect guide for a tour of the farmer's market. Today he led about a dozen local writers on a tour of the market, teaching us about seasonal produce and introducing us to his favorite vendors while he shopped. Though I enjoyed learning about the different nuances of the produce that was and ought to have been in season, I personally enjoyed watching his enthusiasm at every stand. Not only did he handle the produce and select it with the casual ease of someone as experienced as he; he also asked questions that I never would have expected to ask the vendors. Usually when I go on a farmer's market run I'm on a mission, so I rarely stop to do anything except for making purchases and obsessively photographing beautiful food . Having listened to they types of questions he asked, I can't wait to make my next trip to my favorite farmer's market (the one under the freeway on 8th & W on Sundays), so that I can start learning from and developing better relationships with my favorite vendors. 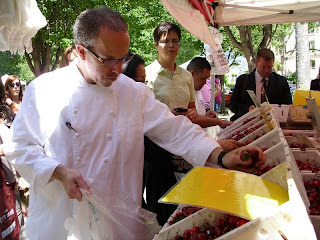 In Chef's shopping bag today: baby artichokes, fava beans, cherries, Medjool dates, young pink garlic, sugar snap peas, and perhaps a couple other items that I didn't notice him buying because I was too distracted by the blackberry honey at Friend's Honey stand (O.M.G!!! I almost tripped & fell, it was so good). We had a brief discussion about the fact that he cannot eat tomatoes unless it's tomato season (which I completely understand, but I'm such an addict I will lower myself to substandard or overpriced, imported tomatoes during the off season just to get my fix; there should be a 12-step program for this) and he talked a bit about this year's strawberry season thus far. It was great to see what inspires a professional, and the best part was that almost everything he had just purchased was going to turn into our special farmer's market lunch. After settling in at Grange, we played the Name Game so that everyone could properly be introduced. I knew a couple of folks from past events, like Brittany & Liz from SacFoodies.com, but everyone else was new to me until today. I finally got to meet Cakegrrl, and Ann from Sacatomato; folks from the Sacramento News & Review and Midtown Monthly (sorry I can't recall your names! My pen was not working with me), as well as Jonathan from Sacramento Press; and Greg, a.k.a SacEats from the Sac Rag. Introductions over, we struck up getting-to-know-you conversations over our fresh bread & herbed butter and glasses of rosé wine. After a few minutes, our amuse bouche of spring onion & potato soup with creme fraiche & chives was brought out. 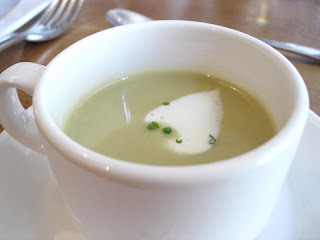 We all fell silent as we savored our soups, something that amused me throughout the afternoon and hearkened memories of my days as a mental health counselor when I'd have to cook for 20+ people and accept that silence as "this food is goooooooood." 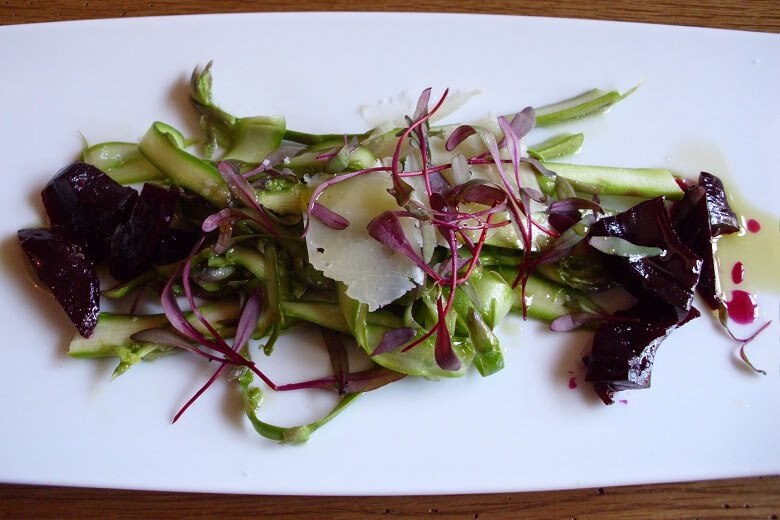 Our next course was a shaved asparagus salad with marinated beets and Bariani olive oil. 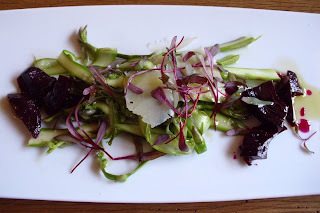 The beets were infused with just the right amount of clove essence for me (though some folks found them too clove-y), with the asparagus and delicate shavings of cheese balancing their flavor. The light drizzle of olive oil rounded out the dish beautifully. We got loud again after our dishes were cleared and had great food-related conversations covering beer, local restaurants, and service vs. quality at restaurants. At one point Greg & I started talking about figs and I have to say his tales of a fig-based Nutella-like spread totally trumped my Colombian preserved green fig stories. I'm totally going to bed dreaming of that and the dessert we'd have later, but I'm getting ahead of myself. Our next course was a lovely spring vegetable risotto with asparagus, baby artichokes, fava beans, English peas and morel mushrooms. It was light but thoroughly satisfying, with a lovely white wine flavor infusing the entire dish, and I loved the creative use of seasonal vegetables. A tiny bit more of the rosé and we were on our way to experience the next and final course: dessert. Now, I don't know if you remember my raves about pastry chef Elaine Baker's incredibly inventive dessert at last year's Duck Off (I mean, really: who else can make such a delectable dessert using duck fat??? ), but let me just say that she has swiftly become my dessert goddess. I know, I know, I like to make my own desserts and love them dearly, but my tiny little dessert shots will forever be dwarfed by someone as talented as Elaine. 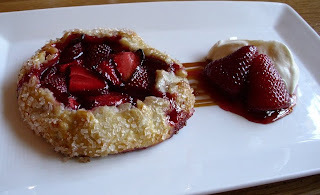 Today she made us a lovely strawberry crostada with creme fraiche caramel, fresh strawberries in strawberry liqueur and even more creme fraiche on the side. I probably should have taken it home as I was already pretty full but that dessert was so phenomenal I couldn't help but finish the entire thing. When all was said and done, I needed a forklift to hoist me out of the restaurant because I was so full, but I didn't mind; a fresh strawberry dessert like THAT is well worth it. It was a wonderful day that gave me just the distraction I needed and I learned quite a bit from the entire experience. It was nice to know that an executive chef like Chef Michael utilizes a similar what's-on-hand approach to cooking as I do (made me feel like I was onto something, lol), and wonderful to meet so many other Sacramento foodies - er, "eating enthusiasts". I hope I was able to offer some good tips on keeping regular farmer's market runs budget-friendly to the fine viewers of News10 and all you fabulous readers, and that the lunch menu at Grange can give everyone some ideas of what you can do with all those veggies & fruits that might appear to have such limited cooking options. As I always say, a little imagination in the kitchen can go a long way, no matter what you may have on hand. And if you don't feel too confident in your kitchen creativity, especially with seasonal fruits & veggies, don't fret! Ask your local vendor or farmer for suggestions; a lot of times they work with restaurants or have fabulous family recipes of their own to offer. Happy farmer's market season! May you all enjoy the best of what your area of this awesome planet can offer, and if you have some favorite vendors, market locations, or seasonal recipes to share, please do so! It's always great to learn about what other areas are producing with fresh, local foods. ~ I bought tropical fruit and I'm not afraid to use it!!! I've never made anything with fresh guavas before, so I'm super stoked to work with this fruit and the other great finds I got from my last $25 Shopping Cart Run. ~ Mother's Day is this weekend and though I'm not sure I can top my mom's birthday crepes, I do have a pretty stellar recipe planned for her Sunday morning brunch that I'm sure she'll also love. (Sorry, Mama! I'm not telling you what's on the menu. HA!) I've been tweeting a few Mother's Day Brunch ideas on Twitter (are you a follower yet? If not, whatcha waitin' for?) so be sure to check them out if you want some good, low-cost ways to spoil the most important woman in your life. ~ Cherries are a-comin'! 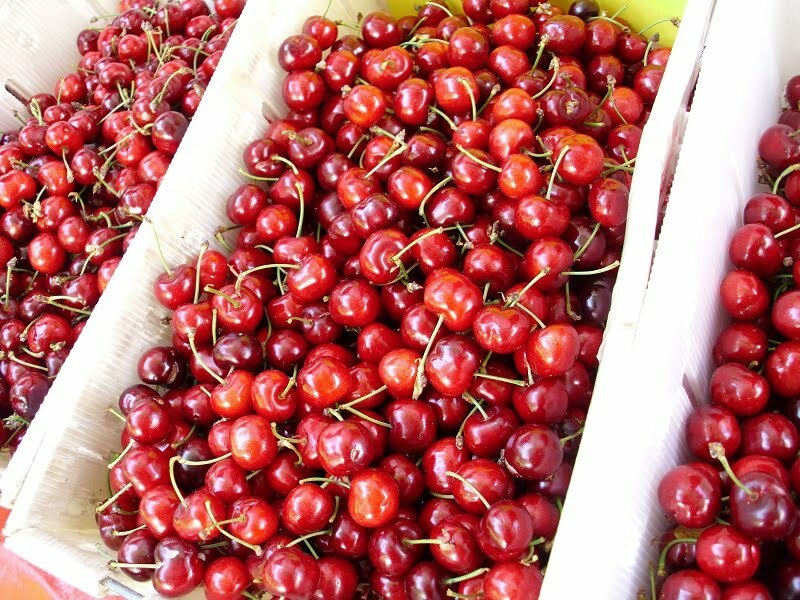 Just saw the first of this year's cherries at the farmer's market and they were gorgeous. The cherry is one fruit I absolutely refuse to eat unless it's in season, so now that they're ready, I'll be taking full advantage of them, too.